Externalised costs and the harmful effects of industrial tree plantations need to be far better understood by governments in Africa and elsewhere around the world. The numerous social problems and negative environmental impacts caused by expanding tree plantations in developing countries in the South are driven mainly by high demand for throw-away paper products and packaging used or wasted by ordinary people and businesses in affluent Northern countries. However additional new demand for plantation biomass as a fuel for power stations and other energy-intensive industrial processes is now causing unprecedented pressure on African land and water resources. Globally the timber industry has responded to this increased demand for wood and other tree derived industrial substances such as chemical cellulose, by further increasing the area under tree plantations, especially in remote regions where community awareness of their negative impacts is low, and there is limited political understanding or oversight. Countries being targeted in Africa include Mocambique, Tanzania, Uganda, South Sudan and the Democratic Republic of Congo. Because countries in Africa are perceived to be a source of cheap labour, land and water, and Northern governments and global financial institutions like the World Bank and the IFC (International Finance Corporation) support timber industry expansion with grants, loans, subsidies and incentives, and/or there may also be inadvertent weak local government, precious biodiversity, land and water resources can be easily be alienated from legitimate local community owners, and then overexploited or even destroyed through the harmful impacts of large-scale monoculture tree plantations. Fast-growing industrial tree plantations generally need to be grown in areas with deep fertile soils, and can consume even more water than the normal rainfall can provide. This often results in water being ‘stolen’ from the surrounding water table, thus causing streams and wetlands to dry out, which also jeopardises local food farming activities and community water supplies. The excessive use of ground and surface water by evergreen plantation trees such as eucalyptus and pine during dry seasons also leads to more serious localised droughts; and this in turn contributes to increases in plantation wildfires that also destroy people’s homes and crops and harm biodiversity. Many of these negative impacts will also cause suffering to innocent future generations, whose lives will be negatively affected by the degraded land and polluted water resources left behind by the timber industry. Millions of hectares of potential food-producing land are being systematically damaged by timber plantations that have already caused the complete loss of topsoil in some areas. To make matters worse, tree plantation activities also cause the rapid spread of alien invasive plants into areas where they never existed before, and the alien plantation tree species used, including eucalyptus, mimosa and pines, are in themselves extremely invasive, having already infested millions of hectares of grassland, wetland and forest in South Africa thanks to the negligence of timber plantation owners and lax government oversight in the past. In South Africa, great environmental damage has been caused by the plantations and pulp mills of multinational paper company Sappi, which has large polluting mills sited on rivers near the towns of Umkomaas, Stanger, Nelspruit and Mandeni. However the pulp and paper mills of Mondi at Merebank, Felixton and Richards Bay also cause severe air and water pollution, whilst consuming cheap dirty energy purchased from the national electricity provider Eskom. Both Sappi and Mondi have made token efforts to reduce their environmental impacts, such as by burning timber waste in their boilers and using recycled ‘grey’ water in the pulping process. Unfortunately these puny efforts have miniscule benefits for the environment and local communities, especially when they are being used to help justify increased production and even more plantations. Thus there is a situation where overseas consumers of pulp and paper products produced in South Africa benefit from unrealistically cheap prices while local ecosystems and communities must suffer the real costs of health and environmental impacts caused by the industry. Pulp and paper production is also one of the worst contributors to climate change through its extremely high consumption of energy derived from fossil fuels; and the CO2 and methane emissions released during the full industrial production cycle of paper and packaging, which includes initial destruction of natural vegetation or farmland, heavy applications of toxic chemicals and pesticides, the use of fossil-fuels in plantation timber logging, transportation and processing, and finally the greenhouse gases emitted by mill sludge, paper and packaging waste, and billions of used disposable nappies that lie rotting in dumps. The idea that the tree plantations which are part of this process could somehow reduce or sequester greenhouse gas emissions, and therefore qualify to earn carbon offset credits is ludicrous at best. The same applies of course to the perverted concept known as REDD+ which purports to be able to offset carbon emissions from industrialised countries by “enhancing carbon storage” with industrial tree plantations! Another major impact of industrial timber plantations is their massive direct and indirect destruction of wildlife and biodiversity, especially in grasslands and woodlands that is caused by converting natural habitat into tree plantations. This also has severe negative implications for the livelihoods of rural communities who traditionally depend on wild plants and animals for housing, food, clothing and medicines. The loss of biodiversity translates into an additional burden on governments and NGOs to provide alternative supplies of food and medicines, and the situation is exacerbated by the migration of people displaced from transformed rural areas to urban squatter slums. This places an even greater financial burden on taxpayers and the state, which amounts to yet another indirect subsidy to the timber plantation industry. Most of the social and environmental costs of tree plantations are therefore ‘externalised’ or transferred to other sectors of society, usually Indigenous Peoples and poor rural communities; but also to future generations who will have had no involvement in the decisions to destroy their land. If these externalised costs, as well as the cost of restoring the land to its original healthy state were to be fully accounted for and included in the costing of the paper, packaging, biofuels and other disposable or combustible commodities made from plantation trees, it should result in a more equitable valuation where the true full cost of the product is reflected in its selling price. This would have the desirable effect of quickly driving down wasteful production and consumption, whilst also making waste wood and paper products far more valuable, thus leading to a situation where 100% recycling would be possible, creating numerous jobs, and preventing the wasting of much precious biodiversity, topsoil, water and energy. In an African or developing nation context this approach should also have a positive outcome in terms of how community land is valued, because at present it is often perceived as underutilised or ‘wasted’ and therefore heavily under-valued or under-priced by global standards. At the moment many regions in Africa are suffering extensive land grabs, where foreign companies are easily able to cheaply obtain long-term ownership of precious community land for next-to-nothing in terms of financial cost. One particularly bad example is that of the Norwegian company ‘Green Resources Ltd’ which has managed to obtain long leases on over a million acres of community land in South Sudan, Uganda, Tanzania and Mocambique for a proverbial ‘song’. It should be obvious that industrial tree plantations represent a major threat to the long term sustainability of not only African peoples’ livelihoods but also to affected local communities in countries throughout the world, including in so-called developed nations like Australia, Ireland, Spain and Portugal. 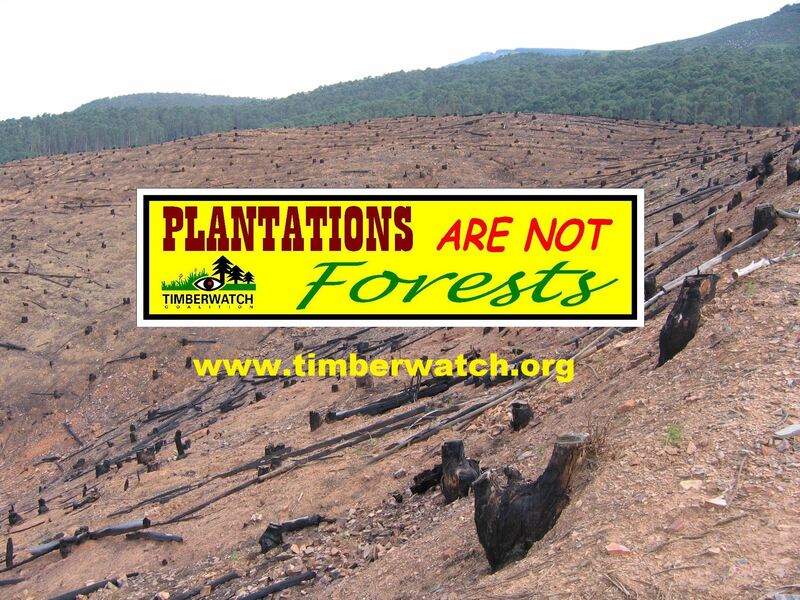 However the global timber industry, stupidly supported by large international ‘conservation’ organisations such as the WWF and Greenpeace, has succeeded in hoodwinking the world through the use of a cleverly devised scheme known as “Forest Certification” that effectively green-washes the timber and paper products of even the worst managed forests and tree plantations. The best known scheme (or should that rather be scam?) is that of the FSC (Forest Stewardship Council) that has devised a feel-good marketing system that glibly assures consumers that FSC certified timber products are from “responsibly managed forests”! So what are you waiting for? Please distribute this message as widely as possible, and add your support to the GeaSphere Petition, and the World Rainforest Movement letter to governments (see links below). The time to make a difference is now! This entry was posted in Agrofuels, Biomass and Bioenergy, Blog, Climate Finance by globalforest. Bookmark the permalink.